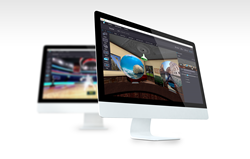 Utilizing the Byond Immersive Suite, companies can effortlessly create, upload, and publish engaging Augmented and Virtual Reality content in minutes with no coding skills required. Byond offers a platform as a service to empower brands and agencies to create their own personalized interactive and immersive experiences. Byond which provides an AR, VR and 360 experiences publishing and CMS platform for brands and media companies like McCann, Coca- Cola, Samsung, HP and Turner, is officially launching its Byond Immersive Suite, in an open beta release. This launch comes after 2 years of development and 6 months of closed beta testing. Today, creating immersive media solutions for Augmented Reality and Virtual Reality requires a unique skillset. In most cases, brands and agencies must employ studios to develop their VR and AR applications, which can lead to long, tedious and costly ad-hoc processes. Additionally, the AR and VR industry is fragmented by dozens of devices such as Samsung Gear, HTC Vive, Google Daydream, as well as cardboard and mobile devices, each with their own protocol. The power of the Byond Immersive Suite, is that it allows companies to effortlessly create, upload, and publish engaging Augmented and Virtual Reality content in minutes with no coding skills required. Additionally, much like building a website, Byond has made the process of creating fully branded AR, VR and 360 content in the Media & Entertainment space cost-effective and efficient, as it allows creators to dynamically create once and publish across all of today’s leading AR and VR platforms. As part of the Immersive Suite, Byond has created solutions tailored to specific verticals such as consumer engagement for brands, media consumption for publishers, virtual store builder for ecommerce businesses, as well as immersive VR and AR tools for learning, training and development. Byond’s initial closed beta phased reached an impressive 300,000 viewers and over 2 million immersive interactions across a wide array of industries and platforms. With the release of Byond’s open beta phase, the company plans on scaling up the usage of their immersive reality content creation platform.